Performers include: Julie Kavner, Valerie Harper, Nancy Walker, David Groh, Lorenzo Music, and Harold Gould. 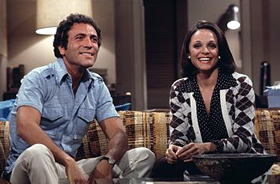 While visiting her hometown of New York City, Rhoda Morgenstern (Valerie Harper) meets and falls in love with Joe Gerard (David Groh), the owner of the New York Wrecking Company who has a young son from a previous marriage. Rhoda decides to move back to the Big Apple and moves in with her parents, easy-going Martin (Harold Gould) and over-bearing Ida (Nancy Walker). That doesn’t work out so Rhoda moves in with her wallflower bank teller sister, Brenda (Julie Kavner). Within weeks, Joe and Rhoda marry and move into Brenda’s building which is guarded by drunken but unseen doorman Carlton (voice of Lorenzo Music). Rhoda starts her own window-dressing business, Windows by Rhoda, with her shy high school friend Myrna Morgenstein (Barbara Sharma). Other characters include divorced airline stewardess Sally Gallagher (Anne Meara); Brenda’s boyfriend, accordion player Nick Lobo (Richard Mauser); neighbor Gary Levy (Ron Silver); the gruff owner of the Doyle Costume Company, Jack Doyle (Kenneth McMillan); and Brenda’s later boyfriend, professional roller-skater and toll-booth worker, Benny Goodwin (Ray Buktencia). The series is a spin-off of The Mary Tyler Moore Show sitcom.